போர் முடிந்த பின்பு, தனது படை வீரர்களுக்கு தீராத தாகம் ஏற்படவே, முருகன் தனது வேலால் கிணறு ஒன்றினை உருவாக்கினார். 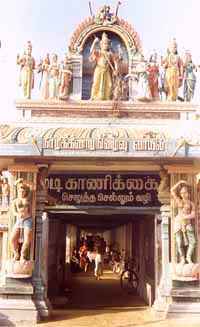 அக்கிணறே நாழிக்கிணறு ஆகும். 14அடி சுற்றளவு கொண்ட இந்த சதுரமான கிணறு அதிசயத்தினுள் ஓர் அதிசயம். இந்த கிணற்றின் நீர் உப்பாகவும் கருகிய நிறத்தில் இருக்கும். இந்த கிணற்றின் உள்ளேயே மற்றொரு கிணறு உள்ளது. ஒரு அடி மட்டுமே உள்ள இந்த கிணற்றின் நீர் தெளிவாகவும் மிகவும் சுவையானதாகவும் இருக்கும். ஒரே கிணற்றுப் பகுதியில் இருவேறு சுவை கொண்ட கிணறு அமைந்தது அதிசயத்தினுள் அதிசயம் ஆகும். Almost imbedded in a rolling high sand dune, and about 200 yards to the south of the Shanmukha Vilasa on the sea beach lies the 19th in the series, a remarkable spring known as 'Skanda-Pushkarani' -- the Nāzhik-kinaru. It is a natural phenomenon. It is a well 14 feet square, and reached below on either of its sides by a flight of 34 steps. The bath there is to be in two waters! One is a remarkable spring of fresh crystal water almost in a stone receptacle known as Nāzhik Kinaru. It is a foot square and about 7 feet deep and inset within the larger major well referred to. The latter is one of saltish and highly sulphurous smelling and muddy-looking water. This swells up during the day and pumped out daily so as not to allow it to over-flow into the smaller one. Where from do these two distinct supplies of water with different tastes spring and how they are kept separate are a mystery and a problem for the physiographers to solve. A bath in the sea as well in these two waters is considered to be of much spiritual merit. The Nāzhik Kinaru swells up and maintains its level in spite of bailing out any quantity of water as the worshippers bathe out of it. Nāzhik-kinaru is said to have sprung up as Shanmukha planted His lance the Vel on the spot. The demons Surapadma and Tarakasura had enslaved the Devas after attaining divine boons. People were tortured by the regime of Tarakasura in the North and Surapadma in the South. After the annihilation of Tarakasura in the North, Lord Muruga came down to South at the request of the Devas to exterminate Surapadma. Celestial King Indra was the peacock, Lord Murugan’s mount. Lord Murugan’s intense battle with Surapadma went on for five days. Surapadman’s brothers and his army were wiped out. On the sixth day Surapadman came to the battlefield all alone. He fought with Lord Muruga with all his might. But he could do nothing against the might of Lord Muruga. At the end, he lurked in his palace under the sea. He emerged as a huge mango tree and confronted Lord Karttikeya. 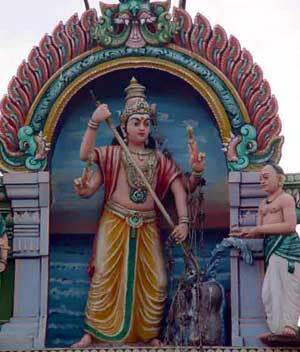 But the mighty spear of Karttikeya-Murugan split the tree in two. A part of it turned into a rooster and the other into a peacock.  Lord Murugan accepted the peacock as His ride and let the rooster adorn His staff. Only after this He is seen with peacock and a rooster on His staff. To quench the thirst of His war-weary warriors, Lord Muruga thrust His lance into the ground bringing out water and forming a well, called Naazhi Kinaru. The square well with the circumference of 14 feet square has a small well within it. 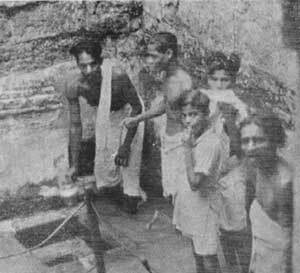 The water in the larger well is brackish and salty in contrast to the smaller one with one foot square in extent which contains crystal clear sweet water. 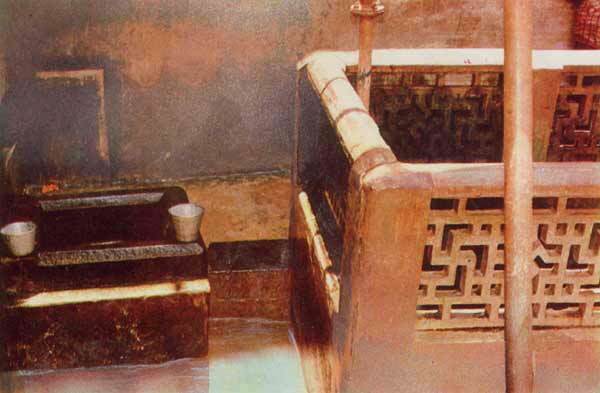 These two wells, despite their proximity, give two completely different tastes which is indeed a divine miracle.